Winter is over but I still do a scarf! we make other exchange this year. They making me a surprise! or a cover to keep the colors of Carlota! I love surprises! Here I am working with Stylecraft yarn and 4 mm crochet hook. Here's a hint, Cristina! You like it? Spring has finally arrived and we go out to play on the terrace. Look, look the lovely assistant gardener I got this year! 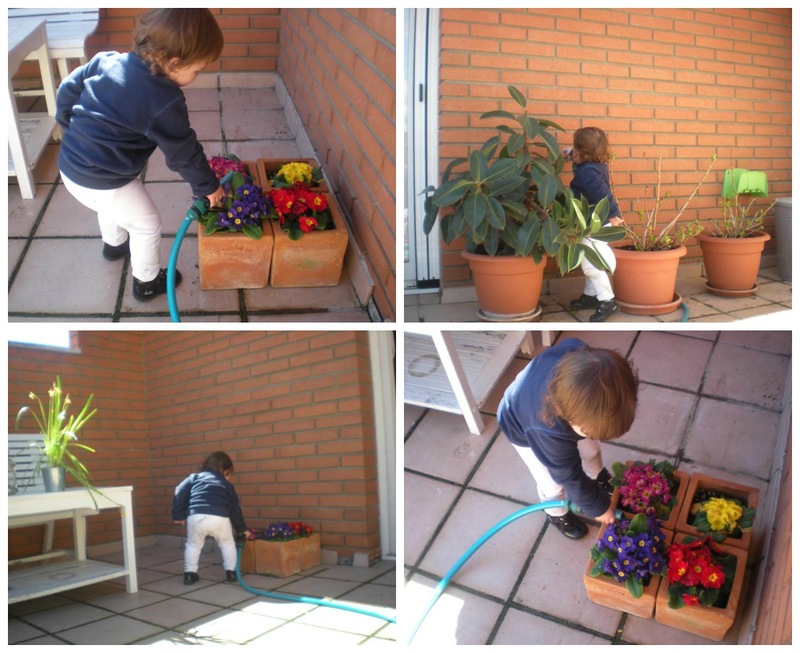 Yesterday she really enjoyed on the terrace. Sun is beautiful! 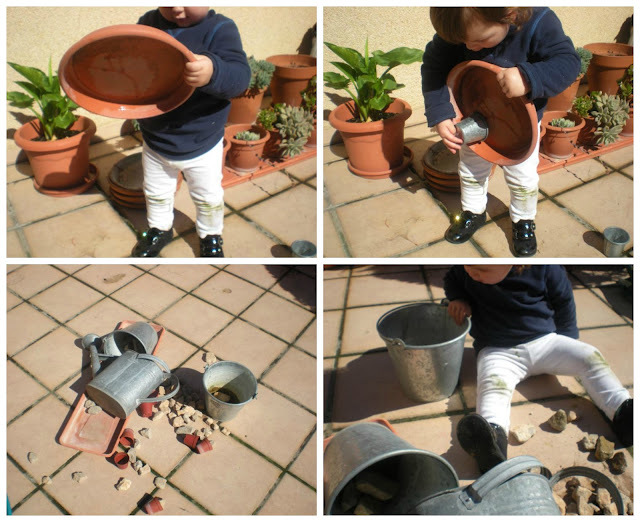 And today we returned to play with flower pots and stones. And the Lulo has come from France! He had stayed there a few more days on holidays! for now it exists only Lulo! We have played all morning, it was very funny! The pants, she, I too...all ended up very dirty! That means we had a great time! I will like already see the beautiful flowers! are the best parents in the world! Ooohhhh que bònic t'està quedant a la Cristina segur que li encanta! Les fotos de la teva filla són una passada. Petons guapa. 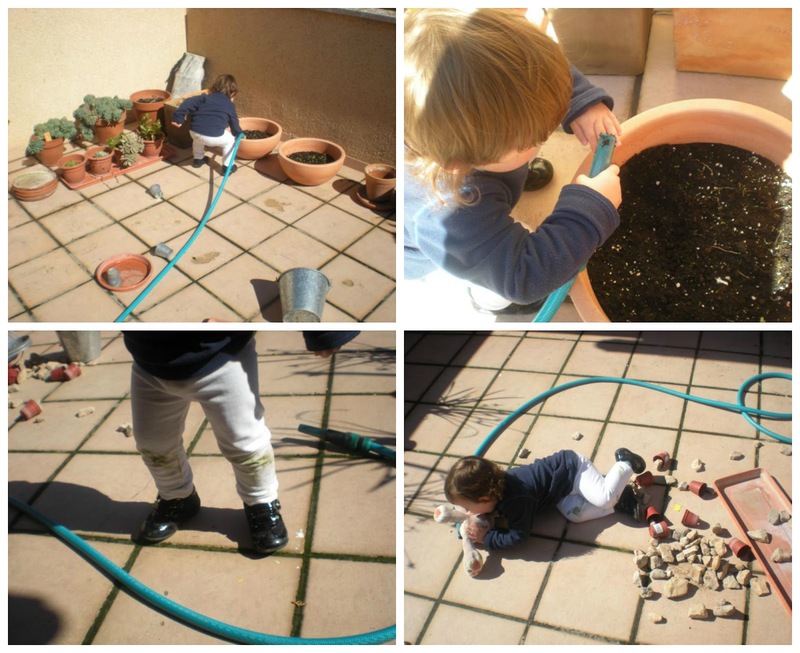 ES genial que le inculques a tu hija el amor por las plantas y la jardinería así el día de mañana será tan buena jardinera como tu. 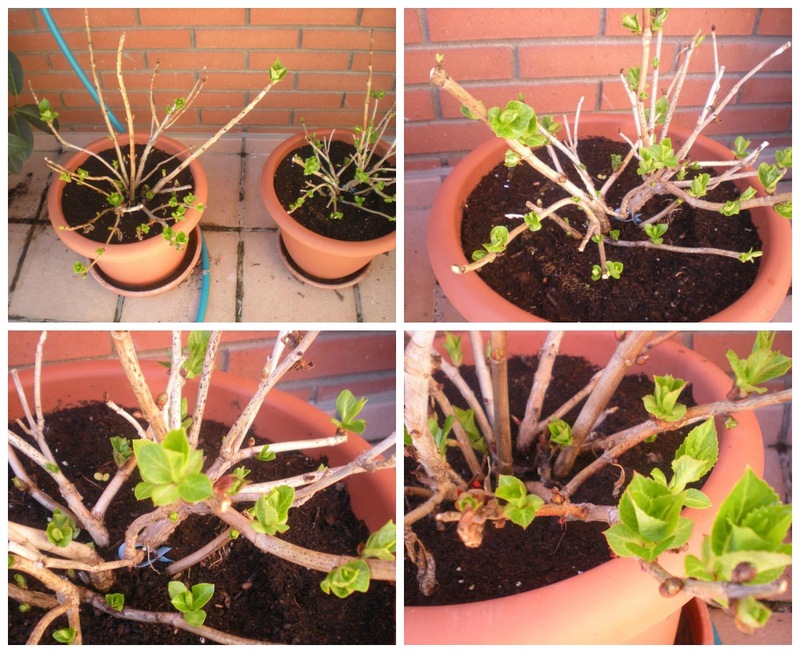 Ya se ven las matas brotando,me encanta ,seguro que en un mes o dos nos enseñaras tu terraza tan hermosa y llena de flores como siempre. best wishes for your father! Your daughter reminds me of my little assistants when they had the same age!!! Cristina quina bufanda primaveral! ja veures com a la Cristina li encantarà!Per cert molts ànims per lo del teu pare, deistjo qie es recuperi ràpid. Aquesta barrufeta és la carlota! està preciosa! Crisssss!!!!! M'encantaaaaaaaaa!!!!!! Els bonyets em tornen boja....ohhhhhhh, genial!!! NO corris que encara no he començat!!!! La Carlota està divertidissima...que guapa!!!! Un petó molt gran i molt fort!!!! Muaaaaaaaaa!!!!!!!! Cristina m'alegro que en Lulo hagi "arribat" de vacances, ja m'imagino la cara de la Carlota com el devia veure!! Espero que el teu pare és recuperi aviat! Quina pinta fa la bufanda!! La Cristina estarà encantada i segur que tu també amb la seva sorpresa! Vaja dues artistes esteu fetes :)! La Carlota està maquíssima! Desitjo que es recuperi aviat el teu pare! Your little gardening assistant is adorable! It's such fun to garden with young children! Sending good wishes for your father.